Congratulations on your upcoming nuptials! Have you been thinking of an outdoor wedding? Do you want your event to be something that is talked about for years to come? Let General Rental offer you 5 Reasons to have an Outdoor Wedding! You have the ability to pick your date and venue. With an outdoor wedding you will no longer be at the mercy of a venue for your date’s availability or catering needs. An outdoor wedding allows you to be able to pick a site that may have a meaning to the two of you, such as a family member’s house, your local zoo or any other place near and dear to you heart, as long as space permits. Having a wedding on a relative’s site will allow you to save on any venue fees. Also, you are able to decide whether you want round or rectangular tables, even what style of chair you want your guests to sit at, not just what the venue has onsite. Because many venues book weddings years in advance if the date you wanted is booked, you are just out of luck or left to find another venue. When you have an outdoor wedding, you get to be the final say on the day you will unite in matrimony. Another benefit is that you are able to save money on your wedding by catering it yourself or being able to select the types of food you want catered in. For example, if your mom has that favorite family dish, you can serve that and let the caterer handle the rest. Remember, an outdoor wedding also allows a couple to involve their loved ones that are furry and walk on four legs! You have the opportunity to work with your favorite local vendors. The ability to pick and choose the vendors that you want to represent your wedding could also help in supporting your local community. The bride and groom are able to break away from those “traditional” florists, bakeries, or caterers and think outside the box to make the event unique. Maybe the cupcakes you love come from a local bakery shop down the street, but the wedding cake of your dreams comes from the another bakery…the ability to order from both places brings that originality and personal touch to your event that people will love. One of the newest trends has been having a food truck or hotdog cart show up at the wedding at the end of your party. What an awesome way to end your event and help curb those late night munchies! Casual or Formal, that is the question. Are you looking to host a black tie event? Something laid back? An outdoor wedding reception can be casual, formal or that perfect mixture of the two styles. Dress it up with fancy linen and a sit down dinner or throw on some plastic table covers and have a barbeque. Another option is to have an extravagant ceremony, then tell your guest to take off those high heels, give them a pair of flip flops that match your wedding colors and watch them kick back, relax and dance the night away in comfort. Play around with the ideas until you find what suits you best as a couple. The entertainment possibilities are endless. When having an indoor wedding your entertainment possibilities become somewhat limited. Being outdoors can bring so much more to your wedding. Your dance floor is no longer confined to the four walls of a building but can become infinite. Need something to keep the kids busy? A bounce house is the perfect remedy. Cooling off after a night on the dance floor seems like a good idea? If you have access to a pool on site why not jump in? Taking a dip will not only cool you off but splashing around can be tons of fun too. If you are an animal lover, choosing a venue like your local zoo is a wonderful idea. Kids and adults alike can enjoy options like a petting zoo, viewing the animals or possibly meeting on an animal. One of the more unique ways to entertain is by providing a place to stay or rather a place to continue the party. If the wedding is at a family member’s home you can have your guest’s camp out after the wedding. Imagine after all the festivities are over; sitting around a campfire, making s’mores with all of your friends and family and reminiscing about the day’s events. This can also be an inexpensive way to accommodate your out of town guest. Adding one of these many entertainment options will make your wedding unforgettable for you and the people you care most about. Make all of your Pinterest dreams come true. For a bride that has been dreaming of her special day since she was a little girl and “pinning” her ideas on her Pinterest boards, an outdoor wedding can make those dreams a reality. While some venues only allow you to use the white linens, basic lighting and the other “standard” items at the venue if you were to have an outdoor wedding the sky is the limit of your DIY wedding décor possibilities. Another advantage to an outdoor tent wedding is that you can include your families in the process. Those wedding planning sessions are a great way for the two families to get to know each other and build those memories. 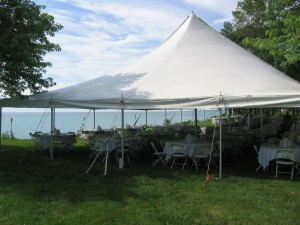 Since tents can be installed as early as you want you are able to have much more flexibility on the days and times to decorate. Many venues only offer you the night before or the morning of your big day to decorate which can put extra pressure on a bride and groom does not need. For example, if you have your tent wedding at your parents’ house you simply need to wake up the morning of your wedding and be at your venue to finish any last minute details. 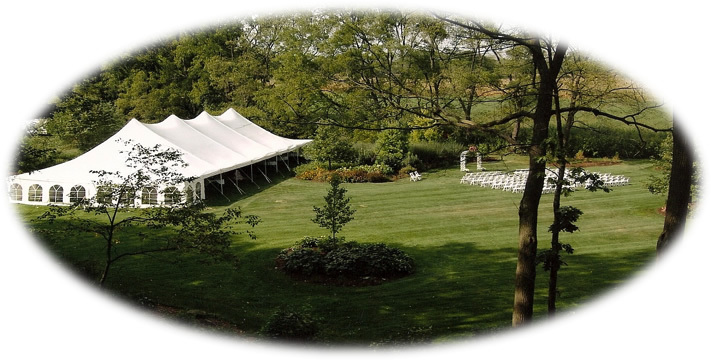 If any outdoor wedding is in your future, let General Rental help make your wedding a memorable and enjoyable event for you and your guests. 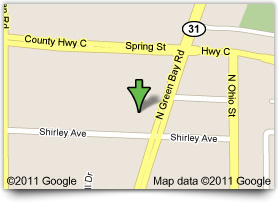 General Rental serves the Racine, Kenosha, and surrounding southeastern Wisconsin areas. Please visit our website at www.genrental.com. Planning an outdoor wedding? 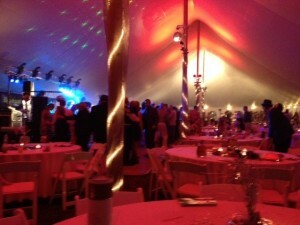 General Rental has party consultants on site to help every bride plan the wedding of thier dreams! We have added LED lighting to our inventory to transform your outdoor venue into the reception people will be talking about for years to come.